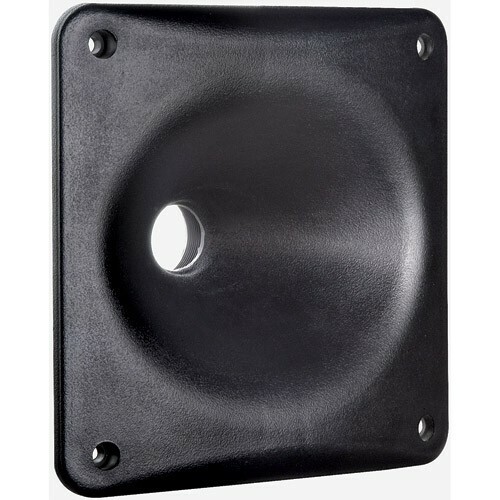 The Dayton Audio H07E high frequency waveguide is precision molded from high-performance plastic, and has an industry-standard 1-3/8″ x 18 TPI throat for mounting screw-on style drivers. A waveguide couples the high frequency driver to the listening space without the harmful distortion artifacts of marginally designed and implemented horn loading. It achieves this through the use of non-traditional geometries and lower expansion rates. The resultant sound has less distortion, with an “open” characteristic not often associated with typical “pinched” or “honky” compression driver/horn combinations. Dayton Audio waveguides reveal all of the articulate, accurate sound reproduction that your HF drivers are capable of delivering, whether the application is live sound, critical studio monitoring, or demanding home audio playback. The Dayton Audio H07E high frequency waveguide is precision molded from high-performance plastic, and has an industry-standard 1-3/8″ x 18 TPI throat for mounting screw-on style drivers. 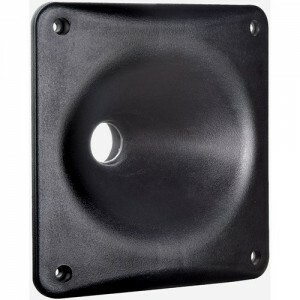 Its unique elliptical flare exhibits a nominal dispersion pattern: 80° H x 50° V, and will provide useful acoustical loading down to 2,200 Hz. Dimensions: 5-7/8″ H x 5-7/8″ W x 3-3/4″ D.